The project has created an outdoor laboratory by encircling trees with 25m masts gushing high levels of carbon dioxide. The site is surrounded by a 3m anti-climb fence, and silvery tubes snake along the forest floor in what looks like a sci-fi alien invasion. The scientists behind the experiment want to find how forests will respond to the levels of carbon dioxide expected in the atmosphere by the middle of the 21st Century. That means full lab conditions: no food and drink in the woods, and no relieving yourself behind a tree. The role of plants in taking up CO2 is one of the known unknowns in climatology. CO2 is a plant fertiliser and researchers think that as levels increase the trees will fix more of it into their trunks, roots and organic matter in the earth. But they believe the fertilizing effect will be limited over time by other factors such as lack of nutrients, lack of water and rising temperatures. Humans and forests currently participate in a mutually beneficial exchange in which trees are fed by increasing CO2, and the trees in turn lock up carbon that would otherwise remain in the atmosphere, heating the planet. Trees are estimated to be storing between a quarter and a third of the carbon produced by burning fossil fuels, and the earth is becoming greener as a result. One of the great imponderables in climate science is how long forests will continue to buffer climate change as CO2 levels continue to spiral. The lead scientist in the woodland, Professor Rob Mackenzie, from Birmingham University, agreed that scientists had previously under-estimated the amount of carbon trees would fix. But he told BBC News: "We are confident that trees will continue to take in more CO2, though we are quite sure that there will be other things that will start to limit that. Rising temperatures will (also) change the ability of plants (to absorb CO2) - they are adapted to current temperatures." Some scientists argue that the tree fertilization effect offers a reason to be less pessimistic about the effects of increasing CO2. But Professor Mackenzie disagreed: "Not at all, not at all. The land is providing us with a fantastic free service by taking up carbon, and there are uncertainties about how much carbon is going into the land… but there is no chance that will offset hazardous climate change." 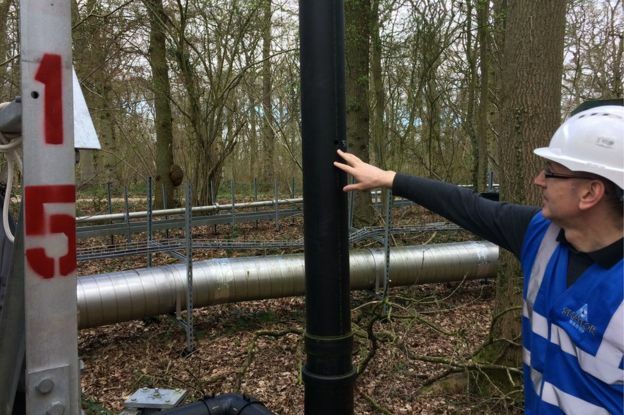 The experiment he is leading will be one of four in different countries measuring the effect of CO2 on trees in the forest environment. It is the first of its kind in Europe. The woodland, named Mill Haft, is part of the former hunting ground of the Earl of Lichfield. It covers 25 hectares and is thought to have been under continuous tree cover for more than than 300 years. The dominant species is the English oak, Quercus Robur, of around 160-180 years. Experiments in the woods will also examine the effects of CO2 at 550ppm levels on the whole ecosystem including leaves, soil, insects and diseases. Professor Mackenzie said: "The impact of changing CO2 should show up in the leaf chemistry of exposed trees within days, and in the soil within weeks. "Within three years stem growth, canopy structure, and a host of other structural forest elements should be different in the patches exposed to elevated CO2. "Continuing out to 2026, the 'push' provided by the elevated CO2 will pass through all the checks and balances of a mature forest ecosystem, allowing, as each year passes, increasingly better estimates to be made of the extent and capacity of the land carbon sink in 2050 and beyond." He said his experiment might reveal other intriguing effects. So trees in a mature forest, in which intake and release of CO2 are in balance, might adapt to high CO2 levels by reducing their pores, which in turn would make them more tolerant to drought. Professor Mackenzie describes the extraordinary site as "a scientist's dream… all my Christmases come at once." Scientists say it is vital to obtain more certainty about how much CO2 rises will be buffered by the sea and land. Optimists hope that the ability of the natural world to soak up carbon can buy time for humans to wean themselves off fossil fuels. A recent study estimated that the growing season had been extended on 25%-50% of vegetated land, largely as a result of more available CO2. One of the co-authors, Professor Ranga Myneni from Boston University told BBC News: "Experiments do indicate a fertilization effect (from CO2) and higher water use efficiency. The same experiments also indicate diminishing effects over time. "We do not know how much of what we observe in experiments translates into the real world. Much of this has to do with how nutrient limitations would play out when CO2 becomes abundant. "Personally, I would not buy the fertilization benefit for the price of global warming and all the impacts that this warming implies, including global warming, loss of sea-ice, rise in sea level, severe storms and loss of biodiversity." The experiment site in Staffordshire has been funded by a Birmingham alumnus and philanthropist, Professor Joe Bradwell, who made money selling diagnostic medical kits developed at the university - mainly in the US. Professor Mackenzie said Professor Bradwell calculated that to offset his carbon footprint he needed to plant 300,000 trees - and the research project was part of his commitment.